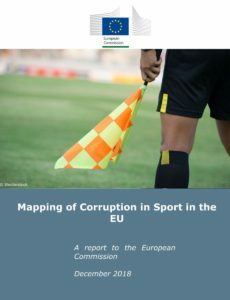 The Commission has published a review of sport and corruption across European Union (EU) Member States. Promoting Good Governance is indeed one of the most importance challenges for sport: and EPSI is proud to face it through our Big4Sports Project. The need to tackle corruption in sport is an important element of the EU’s policy on sport integrity. The ‘rapid’ literature review undertaken for this study has shown that – – despite adopting a broad definition of corruption in setting the parameters of the research, the vast majority of cases identified from recent years in the sample countries were identified as either doping or match fixing cases. The mapping research has emphasized the complex interplay of factors and contextual issues that can influence match-fixing activity. The research has also provided insights in to the diversity of match-fixing practices and its association with other types of corruption such as bribery. Specific examples of match-fixing have also revealed the importance of factors such as pay levels of athletes and the level of media exposure of specific matches. The study has sought to provide the European Commission with adequate knowledge of existing initiatives in order to identify where best to focus its efforts – and those of the Member States – in the years to come.